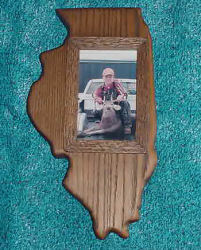 �A unique addition to our line of After The Shot hand-crafted Trophy Plaques is the Picture Plaque. 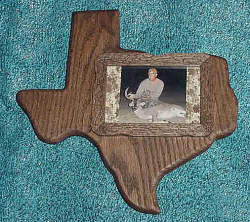 �Made from solid oak they give you the ability to display that special photo of you and your trophy taken on that extraoridinary day when you bagged that 10 point buck or hooked that 12 pound largemouth on the wall next to the trophy. �Our new Picture Plaques are slighty smaller* than our original Trophy Plaques which make them a perfect companion to either our Shoulder Mount Plaques or our original Trophy Plaques. * Depends upon the state. �Each of our Picture Plaques are customized by Rustic Originals Custom Framing to bring out the unique beauty and essence of the state it depicts. Each one is a one-of-a-kind work of art as distinctive as the 4" x 6" photo it holds. 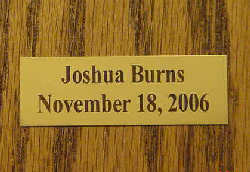 Plaques come with glass and hanging hardware installed. Order your's now for only $60.95! All of our plaques are made to order, please allow up to 3 weeks for delivery. To order by Check or Money Order simply choose that payment method during checkout. Then print order and mail. It's that easy! Send any questions to: sales@backwoodsbound.com.